Coverage: Live on BBC Radio 5 live, plus live text commentary on the BBC Sport website. England scrum-half Ben Youngs has urged his team to "blow away" Australia in the first 20 minutes of their crucial match at Twickenham on Saturday. Defeat on Saturday would result in England becoming the first hosts in World Cup history to fail to reach the knockout stages. 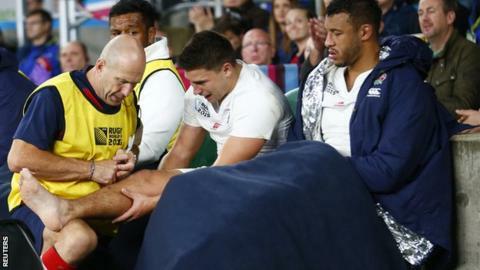 Youngs, who passed a fitness test on Wednesday, said England must go "above and beyond" against the Wallabies. He added: "We've got to come out with a real intensity and edge to our game." The 28-25 defeat by Wales at Twickenham last Saturday, followed by Wales' victory over Fiji on Thursday, has left England needing to beat Australia to keep alive their hopes of reaching the last eight. If England lose to Australia... They are out. If England draw with Australia... Their hopes are still alive. For now. But their fate would depend on the result of the Wales-Australia match on 10 October and how many bonus points the three sides earn in their remaining matches. If England beat Australia... England would almost certainly go through, putting Wales in danger as a loss to the Wallabies would likely spell the end of their World Cup campaign. Youngs was injured during the second half against Wales but has recovered to make the starting line-up on Saturday. "Physicality, don't match what they bring - we've got to go above that. The resilience in the team is the fact we cannot quit." The 26-year-old added that previous results between the two nations - the 2003 world champions have won four of their past five matches against the Wallabies - do not matter. "In the past we've done well, but it doesn't count for anything on Saturday," he said. "But we've got to draw on previous experience. The most we've lost at Twickenham [under head coach Stuart Lancaster] is eight points so the game is going to be close."